We are constantly adding new languages and update translation for existing ones. Thanks to Giuseppe S., we have now added a full Italian translation that will stay updated with all upcoming releases. Appointments plugin has really grown around the globe and we are giving our best to support all customers around the world. Appointments listed in admin panel are also a bit cleaner and are now more in line with Orders UI. Labels are colored and styled in the same fashion and it is slightly easier to manage the appointments for staff. 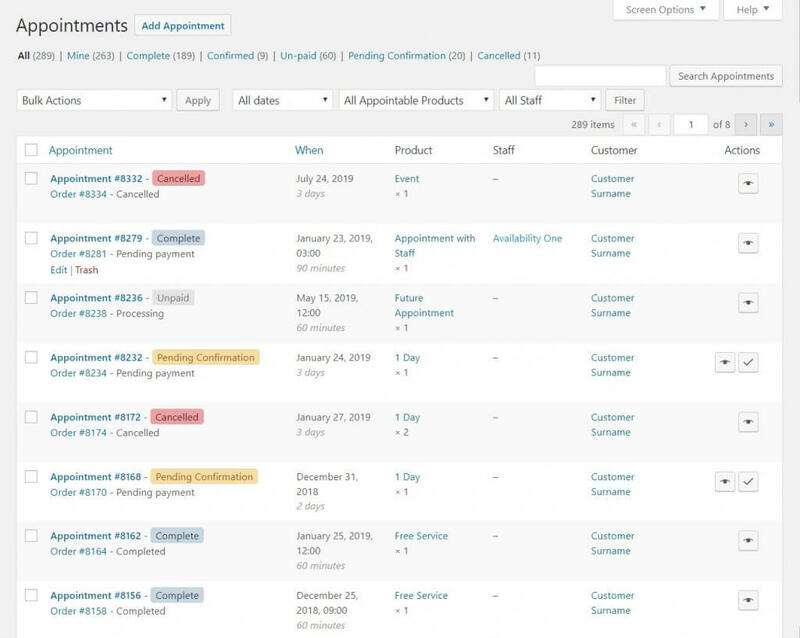 Appointments plugin now has ability to filter products based on availability across all appointable product range. From version 4.3.0 onward, you can add Availability filter widget to your shop page and add your customers option to only display products that are available on a certain date range. This particular enhancement will get improved over time and we plan to make it a lot faster and we also plan to add staff filtering ability very soon. Calendar picker is styled the same as original appointment form and is also mobile-friendly. Everything is pretty simple to configure and use. Take into account that the selected start date is transferred to the filtered products, so when customer selects the filtered product the start date will be pre-selected on the product as well. Feature – Added Availability filter widget. Feature – Added full Italian translation. Many thanks to Giuseppe S. for the contribution. Improvement – Add warning when adding Appointment to cart that requires confirmation and simple product is already in. Improvement – Updated all translations. Improvement – Updated Action scheduler library to 2.2.0. Improvement – Updated Product Add-ons to 3.0.7. Improvement – De-cluttered appointment list UX and unified status label UI with WooCommerce order label UI. Improvement – Incompatibility with Elementor plugin. Fix – All users see staff fields in user edit screen.